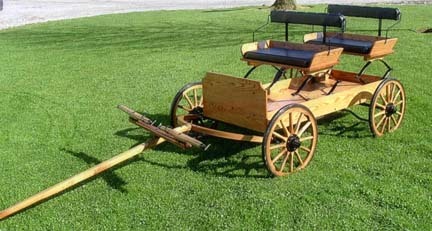 Mini Buckboard with side boards (single or pairs) and naugahide seats - $1400 for wire wheels or $1700 for wooden. Comes with shafts OR a metal pole. Add $200 for a wooden pole. Add $100 for padded seatback. Block brake included. 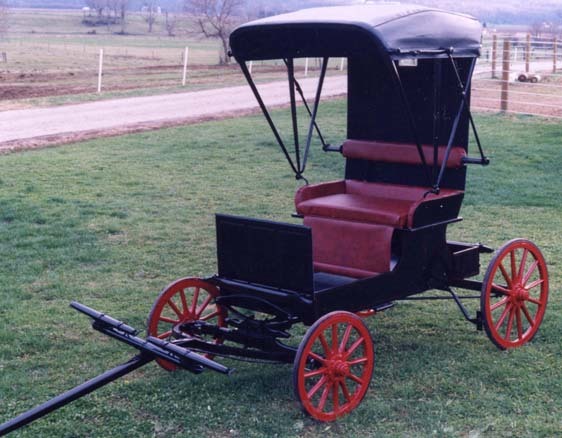 Weight around 185 pounds with the wire wheels and 229 pounds with the wood wheels. Fits up to 11 hand pony. 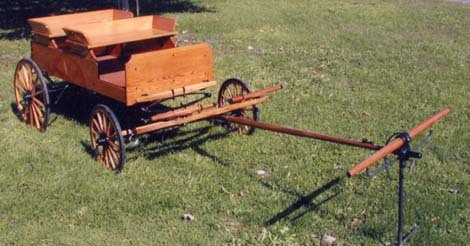 This wagon is approximately 5 feet long and 26" wide. It can fit and adult and child side by side. 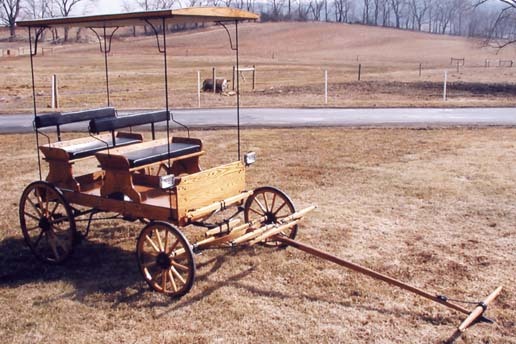 The outside width at the ends of the axles is approximately 48". 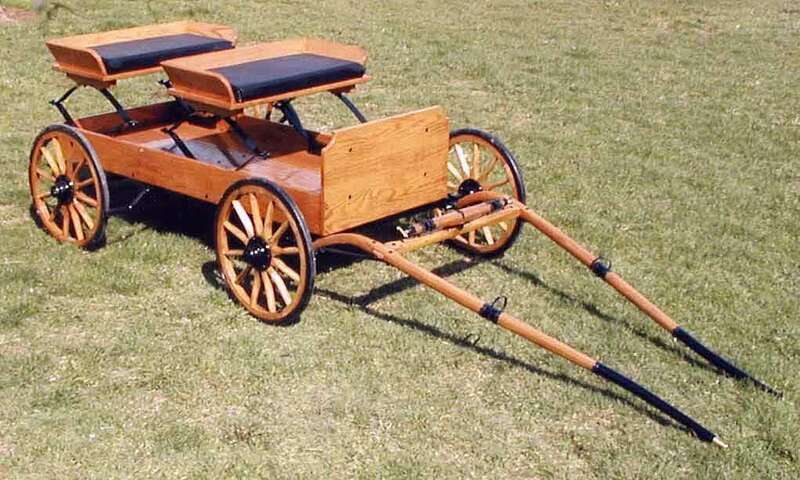 Mini Spring Wagon includes: whip socket, naugahide seats & seatbacks, block brake, and shafts for $2400. Same with shafts AND pole $2600. Size: 5' long, 32-34" wide and 307 pounds. Only comes with wooden wheels. Option to Cut under in 2 ways: 1. smaller wheels in front, 2. Full cut under styling +200. Surrey top $450. Fits two adults side by side. The front wheel makes a good step to get in. There isn't enough room (since it is cut-under) to put a step in the front. Total width is approximately 57". 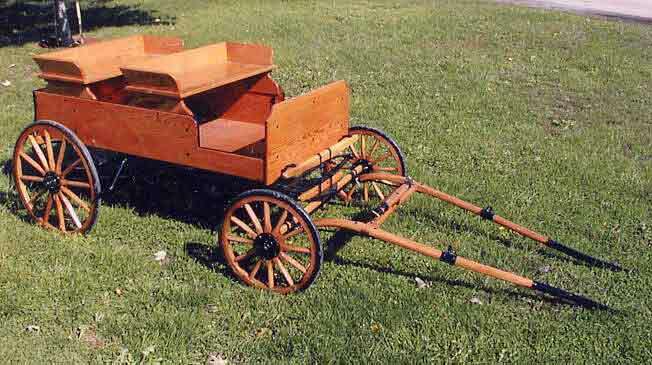 Pony Spring Wagon includes: 2-4 steps, whip socket, naugahide seats & seatbacks, block brake and shafts for $2500. Same with shafts AND pole $2700. Size: 6'2" long, 37" wide. Wheels 32" rear/26" front. Can fit up to 15H. 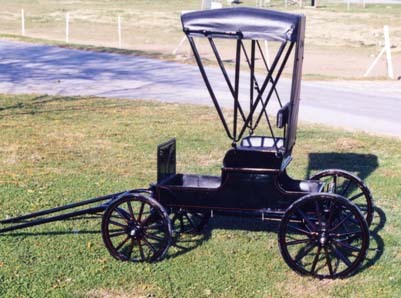 Comes standard with: shafts, (add 5’ pole $425), patent leather dash, painted, full vinyl top with a lining, upholstery, footbrake, wooden wheels (18” in front and 22” back, but other sizes can be ordered except that turning radius gets smaller), rubber matting on floor that goes all the way thru, open box on back that can hold items. Can add pin striping for $75 (outlines body, shafts, and wheels), 2 pairs of brass hubcaps $50, bigger wooden wheels if desired. Very easy to change shafts/pole.